With two regular-season games remaining in the 2013 NFL season, it may appear as if there isn’t much for the Cleveland Browns to play for other than draft position. But the Browns still have an opportunity to add a dubious entry to the franchise’s record book – the lowest rushing total for a team leader since the NFL went to a 14-game schedule in 1961. 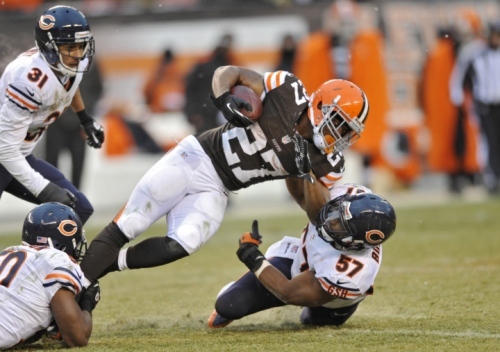 Even though he has played just 11 games for the Browns this season – and may not suit up again this year – it seems like a lock that Willis McGahee will end the year as the team’s leading rusher. McGahee’s current total? Three hundred and seventy-seven yards. Ray Renfro holds the franchise record for the fewest rushing yards in a season with 352 in 1953, but that comes with a caveat. Renfro only ran the ball 60 times that season and averaged 5.9 yards per rush. Give him 138 carries (McGahee’s number this season) and Renfro would have ended up with 814 rushing yards. So even though McGahee has (barely) surpassed Renfro’s total, this season has unquestionably been the worst rushing season in franchise history. (Even during the stench of the expansion season in 1999, Terry Kirby managed to rush for more than 450 yards.) And even in today’s pass-first NFL, the Browns running game is a complete embarrassment. Things have gotten so bad that the Browns could only gain 93 yards on Sunday against a Chicago Bear team that came into the game giving up an average of 157 yards per game on the ground. The Bears also came into the game having allowed a 100-yard rusher in six consecutive games, a streak they easily broke against a Browns team that was led by Edwin Baker’s 38 rushing yards. After putting up those gaudy numbers Baker is the flavor of the week among some fans and the media who think he is going to be the answer to the team’s running back woes. Because that worked out so well with Fozzy Whitaker (80 yards on the season) and Bobby Rainey (34 yards with the Browns before being released), who once upon a time this season were going to save the day. Imagine the reaction if Baker breaks 50 yards on Sunday against the New York Jets? The lack of a running game probably wouldn’t be as big of a problem if the Browns had a game-changer, rather than a game-manager, at quarterback, but that is not the case and goes a long way toward explaining why the team is once again sitting at double-digit losses for the season. With just two games to go in the season, there is nothing the Browns can do about the running game. So let’s enjoy this historic moment while we can, Browns fans. And let’s also hope we never have to witness this again.